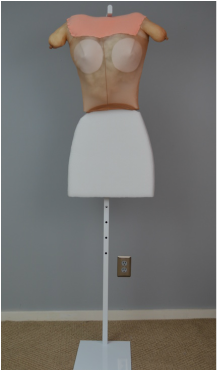 Our gender-neutral manikins fit extra-petite to extra-large women; small to large-sized men; and juveniles. They can be easily fitted with soft arms and legs. Two types are available. Traditional manikins come equipped for display on any stand with a 5/8-inch pole. They are ideal for 360-degree viewing of dresses, coats, and other items that can accommodate a central pole. 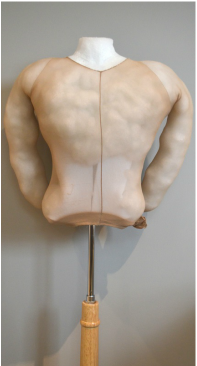 Manikins can also be placed on a base for table-top display of bodices, waistcoats, and other short garments. Manikins are not suitable for pants, shorts, or bathing suits. Andover Figures manikin M1 padded out. Shallower suspension forms are designed to hang from a wall bracket or a stand. They allow costume to be displayed against walls, in vitrines, or other locations where items will be viewed from the front and sides. Suspension forms make display of pants simple and are an excellent solution for unstructured garments. Andover Figures suspension form S4. Andover Figures suspension form S4 padded out. There are two commercially available stands that we recommend for Andover Figures manikins. A round base is available in black and natural wood. A tripod-leg base is also available in black, white, and natural wood. A commercially available metal stand is available that allows Andover Figures suspension forms to be placed anywhere in a room. It is available in white, black, and metallic grey, and adjusts to any height.